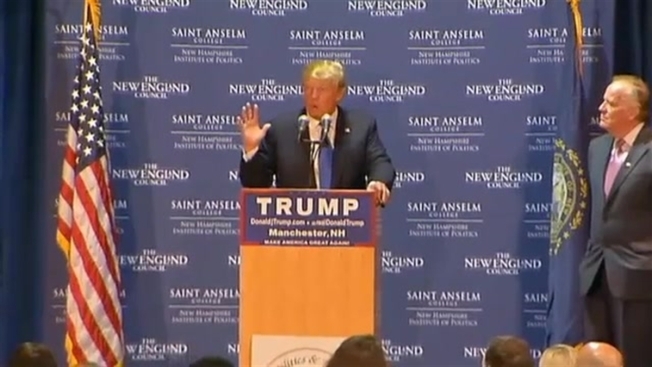 The real estate mogul spoke at the long-standing New Hampshire speaker series "Politics and Eggs"
Donald Trump drew what was described as the largest crowd ever, more than 700 people, to the long-standing New Hampshire speaker series, "Politics and Eggs." Trump joked about his one hour of post-debate sleep, and then did something he's never done at a rally before: called two of his five children on stage. Donald Trump Jr. talked about the amazing journey the primary had been for his family, while Eric Trump said his father was his best friend, that he loved him very much and that he was very proud of him. Trump then answered questions. Concerning Social Security, Trump said he would "leave it alone." On the subject of police, he said he thinks "police are not being treated fairly in this country." Meanwhile, Trump described teachers as the "most underpaid people on earth." And there was the New Hampshire veteran who said, "I want my damn book signed for my wife." Trump's star has continued to rise in New Hampshire, even as his critics call him a bully and offensive to women, pointing to comments like the one in Tuesday night's debate when he asked why Carly Fiorina was always interrupting, even as several other men on the stage had been interrupting as well. Asked about that, Trump said, "They were so happy when I did that because everybody that was speaking, Carly would just come and interrupt him. So I mentioned it and it was good and I think she understood." Meanwhile, Trump says his children will play a growing part in his campaign. When asked if he worried about the impact the grueling campaign schedule will have on his 69-year-old father, Eric Trump said, "No, he's the Energizer Bunny. He's got more energy than quite frankly, I do. He's an amazing guy and he'll work the same way for this country and that's what this country needs." "He's always been a machine. That's just the way he is. He's always been programmed that way. I mean, this isn't anything unusual for him. It's not like he's stepping out of his norm. That's what he is," Donald Jr. said. Frank Licata of Ossipee, New Hampshire, said he was impressed by Trump's sons saying it showed they love and respect him.